No Problem is an extremely suspicious program promoted at www2.noproblemppc.com. The information found on the website claims to offer services for advertisers, affiliates, and advertising partners. The site claims to offer the advanced pay-per-call technology that should create different opportunities for online advertisers. Advertisers are offered to begin a free pay-per-call trial with a $30 credit, and publishers are presented with a widget that is supposed to “start making money” right away. This is not the software that should be installed onto any computer. We recommend removing No Problem software, and if you do not know how to delete this software, you should read our report. We identify No Problem as an advertisement-supported program created by One Call Ltd, a company that is better known by the name Simply Tech LTD (also has created Zapp). No Problem is very similar to such advertisement-supported programs as PastaQuotes and DonutLead. In fact, it seems that these programs are connected, because No Problem can display ads related to PastaLeads and DonutLeads. If you do not delete No Problem, you might also face the advertisements with the tag “facebook app.” It is essential to remove the advertisement-supported program, because the shopping ads, coupons, and other offers it will display cannot be trusted. If you are running the newest version of the Google Chrome browser, this adware will not affect you as much as it will affect the users of Mozilla Firefox and Internet Explorer users. 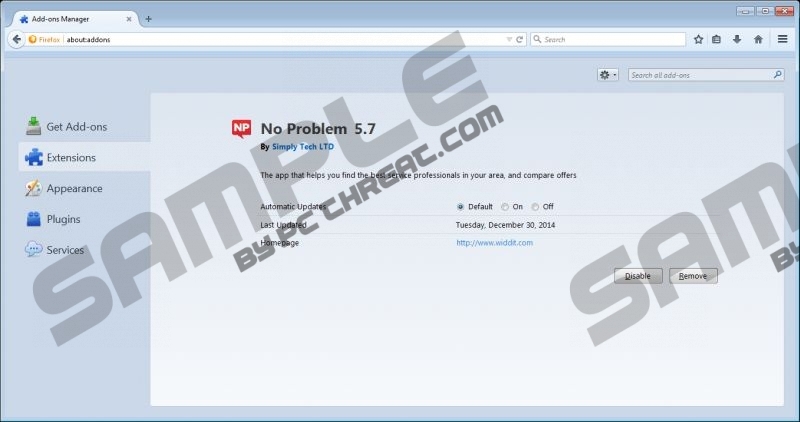 The new version of Google Chrome automatically blocks No Problem. If you have reviewed the General Terms of Service document, you must know that No Problem can provide third-parties with the opportunity to submit, post, and transmit information in the form of data, text, video, messages, etc. According to our researchers, No Problem can display fictitious Java and Flash Player update offers. If you fall for these fake offers, you might be tricked into downloading even more malicious programs that could flood your browsers with even more misleading offers and messages. If this has happened already, you have to delete No Problem-related malware as soon as possible. Make sure you scan your operating system before you start the removal of the undesirable software. Some of the active threats might run secretly, and you might fail to detect and delete them by yourself. You must delete No Problem adware from your PC. We recommend using automatic malware removal software, like SpyHunter, to delete the suspicious application from your operating system. Some users may be able to remove No Problem and the related malware manually as well; however, this is a task that only experienced computer users should tackle. Select Uninstall a program and right-click No Problem. Select Uninstall to delete the application. Double-click Add or Remove Program. Quick & tested solution for No Problem removal.